After finishing my 30 comparison reviews and refining the criteria adding things from a variety of theorists I thought I should compare the game I’m making to the same criteria and think about how I should deal with each aspect. This game falls under AGON because you will be ranked at the end of every stage, these ranks will go all the way from SSS (the best) to T (for terrible). You’re ranking will be based off damage taken, number of continues used, time taken to complete each stage and enemies killed. The rankings will be entered into a leader board automatically which can be compared amongst your friends on your private leader board and across the world on the open leader board. This game falls under MIMICRY because you are taking on the role of Shin Haroki in his quest to make his manga No. 1. Competence – There will be a variety of stages with multiple parts allowing for a sense of progression You would not get the same sense of progression if each Level was not made of several smaller stages as one long level would seems to go on forever and feel more like an endurance match. Autonomy – I would like to have a dialog tree for each of the main characters interactions. 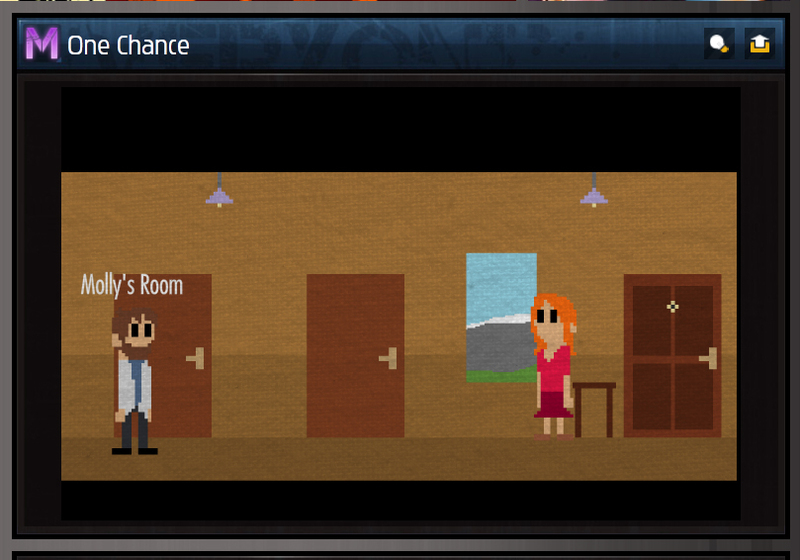 The player will then choose from different dialog options and have them lead to different conversations and items. I would also like to have multiple endings that will add replay value as well as a larger feel of control. 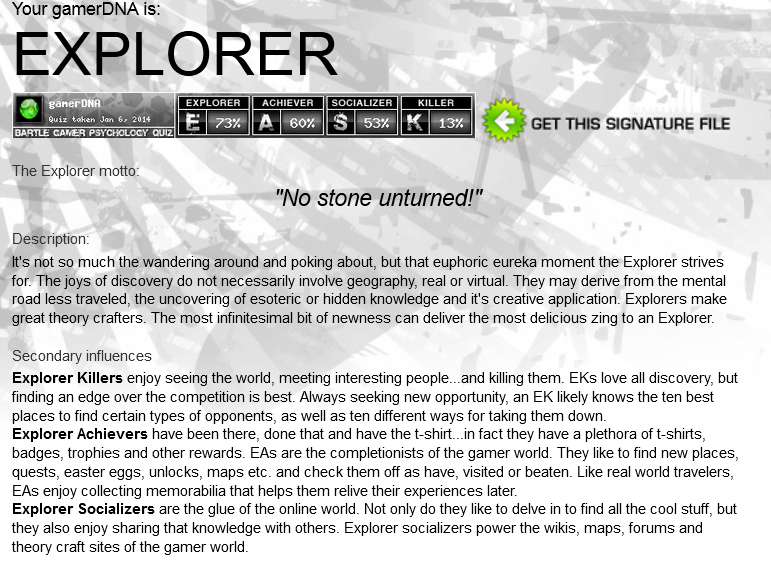 Explorer because I would like to have multiple endings depending on the players choices throughout the game. Achiever because of the rankings you would receive from each level which would unlock bonuses. As the game goes on check points become more scarce making the player have to go further back till their skills are sufficient to complete the obstacle. Dieing will cause the player to return to the beginning of the stage or the closest checkpoint if a player dies while they have no lives left its game over and you have to load the game. You will also loose points in the rankings at the end of each stage for using continues and taking damage. Rewards will take the form of power ups and new skills gained from beating bosses or reaching a specific milestone as well as higher rankings at the ends of stages for performing well and not taking damage. I would hope that the competitiveness between friends would motivate people to play stages again. This is why I plan to include a private leader board which only compares you to people on your friends list, which means that you can see which of your friends scores are higher than yours and then you can try and beat them. The inclusion of multiple endings and branching dialog trees will help keep the story mode from feeling to much the same. The inclusion of other playable characters after you complete the game would also increase the games life span. Trophies and achievements will keep people who play that meta game playing until they have unlocked everything adding extra incentive to casual players to pick the game back up as well. Doing this review made me think of things that I was overlooking like what platform I would like to put my game on and what type of player was I aiming to attract. I chose only Sony consoles because of the cross play feature they provide allowing you to continue your save no matter which of their systems you are playing on. I also chose PC because of the promotion you get from being sold on a store like Steam, new launches on steam are mostly featured on the from page and it is one of the most used digital stores in the world so that is a big deal to be seen on the front page of a store that gets a huge amount of traffic. Braking things down like this really helped me see how my game would fulfil each element and writing it down in this format made it more clear to me. This is something I will definitely keep in mind and review future game ideas in the same way to make sure it will fulfil its full potential. Killer – A player who enjoys fighting other people rather then computer programmed enemies. Explorer – A player who enjoys searching every area thoroughly at there own pace searching for secrets, and gets annoyed when there are time limits moving them along. Achiever – A player who enjoys gaining every reward possible even if it grants little to no game play advantages. Socializer – A player who enjoys making friends and talking to other players rather than play the game. I feel that this is accurate even though I don’t play online games which the questions are geared to as I mainly play single player RPG games and try to achieve 100% in game and in the trophies meta game. This game falls under AGON because you have clear objectives at the beginning of every round while the military try to kill you. There are also has a survival mode were you see how long you can last and your time at the end is put onto a leader board so you can compare yourself to everyone else who has played the game. 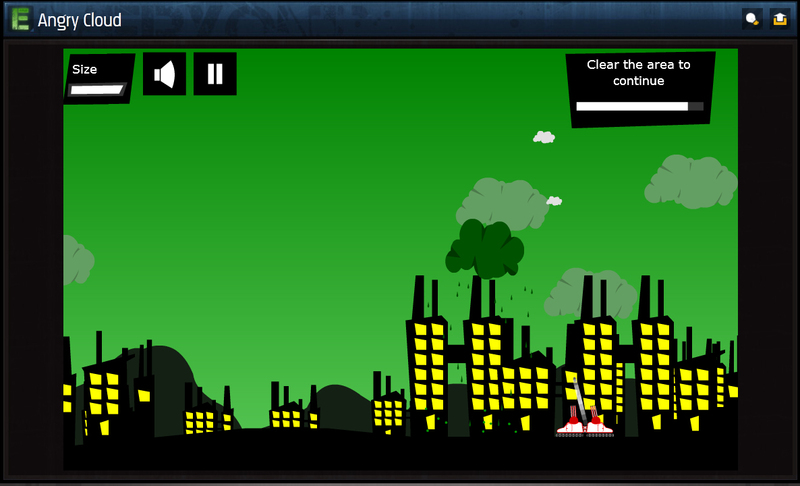 This game falls under MIMICRY because you are taking on the role of a cloud who has being poisoned by pollution. Competence – You are able to very quickly progress through the first stages and overcome challenges in the later ones allowing you to feel a seance of mastery. Achiever – Because you can progress quickly through the game and there is only one goal to fulfill on each level. There are no real punishments in this game besides loosing health when you get hit and restarting the level when you die. The rewards in this game are the choice of an upgrade after every level. The only reason to keep playing this game after you have completed it is to try a different combination of upgrades in story mode or trying to get a high score in the survival mode. 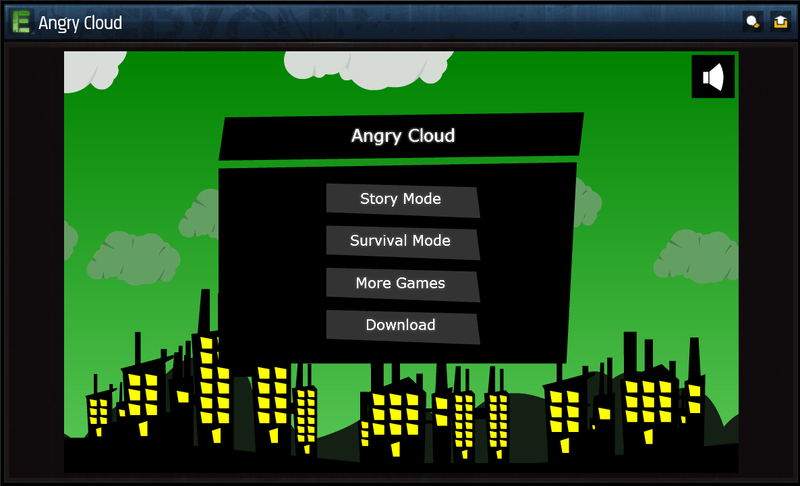 Angry Cloud is a game about a cloud named George who gets taken over by pollution which makes him angry, each level has a different objective to complete which is always destroy x number of something or clear the area. Every time you complete a level you can upgrade yourself either in, speed, growth, health or damage. 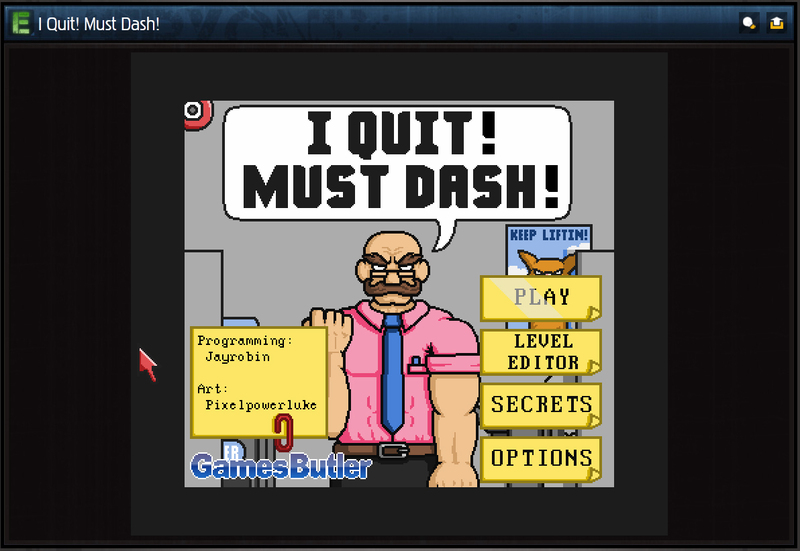 You control George by moving your mouse cursor and he will follow raining death on anything below. There are also has a survival mode were you try to survive as long you can at the end of which your time is put onto a leader board so you can compare your time to everyone else who has played the game. I found myself getting into flow with this game by the fourth or fifth stage as the amount of tanks greatly increased making the challenge more suited to my skill level and every few stages had a new enemy which presented a new challenge keeping the game interesting. This would not have worked as well if the game had thrown everything at you withing the first few stages as spacing them out gives you time to get use to the current enemies and then shake up your strategy by introducing new foes to deal with. Name: I Quit! Must Dash! This game falls under AGON because each level has a target time to achieve and the game is all about timing and procession. Competence – This game has quick progression with each level only taking a few second if you have the timing of each jump mastered. Achiever – This game has plenty of levels and collectables for achievers to complete and collect. Punishment is very basic you retry the stage every time you die giving death little consequence. Rewards come in the form of bonuses and medals by finishing the level under the set time and collecting the pay slips. The replay ability of this game comes in the form of collectables and bonuses which you can obtain from each level, however if you are not a completionist this draw will not keep you around. I Quit! Must Dash! is a game were you only use one button the space bar or click with the left mouse button to make the character jump over obstacles, the character runs forward automatically and changes direction each time he hits a wall. 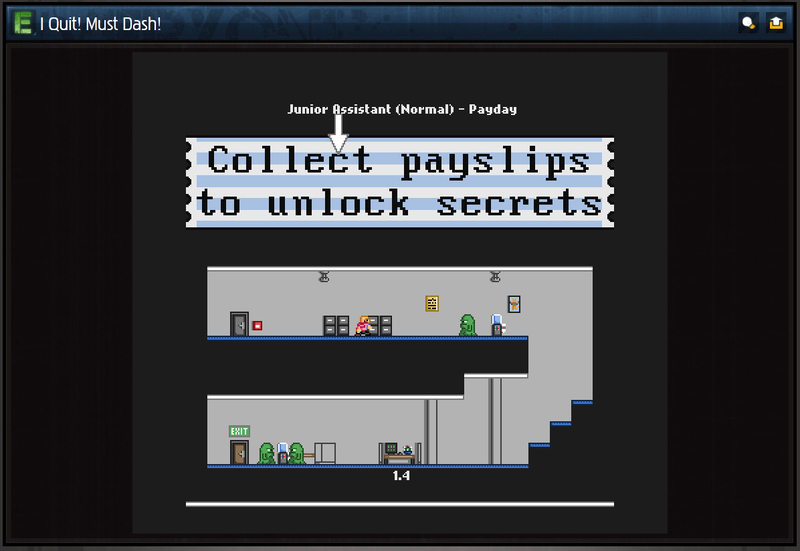 each level has a pay slip to collect which unlocked bonuses and a target time to finish under. I found myself getting into flow with this very easily as the skill to play is very low but the difficulty of each level is progressively more challenging and you will soon start to die… a lot. This opens up the challenge of learning the movement pattern of the obstacles and getting your timing right to collect a payslip you don’t want to miss or just to succeed. I found myself playing the same level for 10 – 15 minuets trying to get the timing just right though it felt like I had only been playing the stage for one maybe two minuets. This game falls under MIMICRY because you are taking on the role of a scientist trying to save the world from a threat you created. You accomplish this by choosing what you will do each day. Autonomy – The game gives you the feeling of choice, that your decisions will determine weather the planet survives or not. The game does not seam to cater to a specific player type because explorers are usually associated with games that fulfil the need for autonomy’ however with the visual novel play style the game has you dont have much freedem to explore the world. The achievers also cannot try every possibility and see every ending with multiple play throughs as you can only play the game once. similarly there is no one to kill to satisfy killers (besides letting the world die) and no multilayer for socializers meaning this game does not cater to a specific player type. You only get one chance screw up and the world dies succeed and you save it. The game does not even try as you can only play it once. One Chance plays a lot like a visual novel were there are several paths that branch from each choice giving a verity of endings with only one route to the correct ending. In one chance you play as a scientist who invented the cure to cancer, but its killing all cells and not just the cancerous ones, you have once chance to save the world. Like the name suggests you can only play the game once if you refresh it will stay on the last screen you was on, this adds real weight to each decision and made me think carefully about everything I was doing. This style of play would have lead to flow but sadly this game was to short to allow for that as it only lasts five to ten minuets but those five/ ten minuets are extremely immersive because of the weight and consequences you feel from each choice. The weight of these choices could be considered punishment and reward as making the wright decisions will reward you with a happy ending while making the wrong choices makes it very clear that you failed and does not provide the same closure. This game falls under ALEA because you can spend your time searching for weapons and survivors which can fail and you can also lose survivors while searching so it takes a lot of luck not to lose anyone and fined new things. 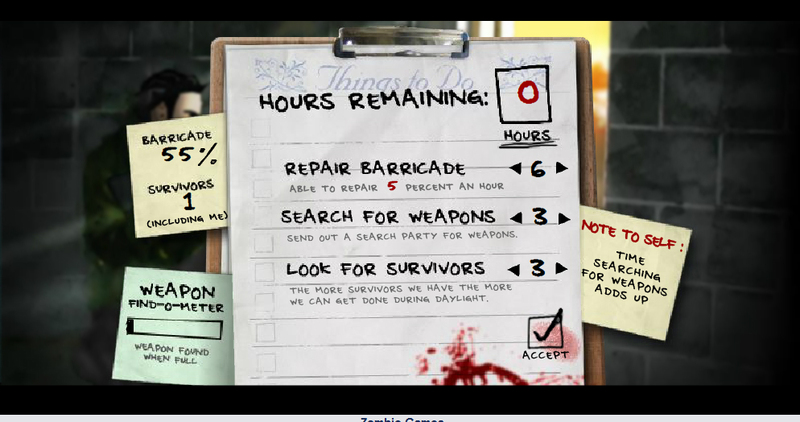 This game falls under MIMICRY because you are taking on the role of a survivor in a zombie apocalypse and have to make decisions on how to spend your time. Competence – You can easily get through the first nights and are rewarded for having a more precise aim. Autonomy – You are given choices to make at the start of every game on how to spend your time this determines what weapons, survivors and health you have throughout the game. Achiever – The amount of possibilities you can do to get the best equipment to progress through to the end give achievers plenty to explore to come up with a perfect game strategy. A punishment for dieing is to retry the night or start the game from the beginning if you don’t have enough to make it through the night no mater what you try. Rewards are increased chances to fined guns on certain levels. The amount of choices to mid max your survival team combined with the difficulty are what gives the game its depth giving the player plenty to experiment with after every stage until they finally beat the game, once the game is done there is very little to do besides collect every weapon in a run through. 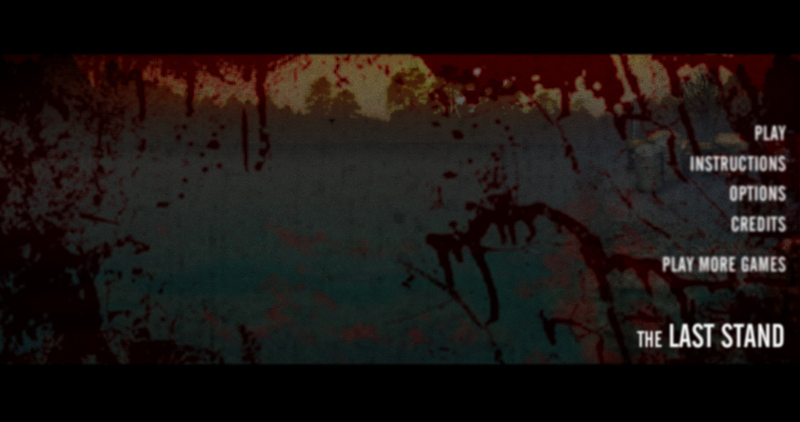 The Last Stand is a game where you take on the role of a survivor in a zombie apocalypse. During the night you have to protect your barricade from zombies, and by day you spend the twelve hours you have repairing your barricade, searching for weapons or searching for survivors. If you die during the night you can retry and have an opportunity to change your weapons if you have alternatives. I found myself getting into flow very easily with this game as I refused to lose and started again several times performed different actions like focusing on searching for weapons and repairs, then focusing on survivors until I found a pattern that was sustainable. The fact that you can kill zombies faster by hitting their week spots means you will replay the night over and over trying to kill them faster and survive so you don’t have to restart the game. This is a good example of skill (selecting the optimal choices) and difficulty (killing the zombies) balancing out with an element of luck (weather the choices will succeed or fail). This game falls under ALEA because you don’t know what kind of handicap you will receive at the beginning of the game or how it will affect the game play. This game falls under MIMICRY because you are playing as a character who has a disability which handicaps the way you play the game. 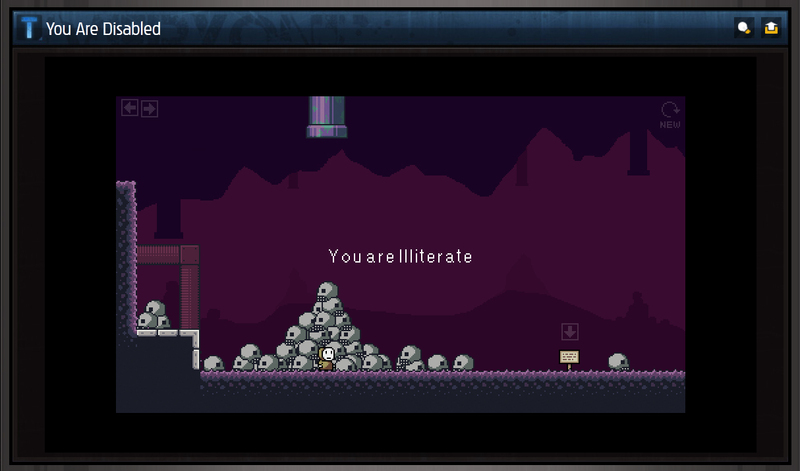 Competence – The progression in this platformer is extremely quick at times but it is not like other platformers with multiple levels the progression is completing the platforming challenge on each screen. Explorer – This game suits an explorer because of how each screen is a mystery and you cant tell how close the the end you are so you are curious to how much longer the game is. There is little punishment in the game as dieing just puts you back to the start of the screen. However you could consider the disability the game gives your character a punishment causing you to struggle more or less with the game depending on what you get. I did not fined any rewards in my play through. The game is very long and challenging making it hard to see the end and the curiosity of seeing all the disabilities will may entice you to play the game a few more times but the novelty soon wears off. Every play through you are given a different disability in my first play through I was a spastic and my character moved by himself every now and again screwing up my jumps onto small ledges or just running off the edge of the platform I managed to jump onto. This adds more challenge to what would be a simple platformer but the difficulty feels more artificial because you are fighting against the movements of your avatar, you do however get a slight warning as to when your character s going to move by it’s self as the screen shakes side to side just before it happens. This seance that you could loose control at any moment had me rushing to make jumps before I lost control again this actually changed how I usually approach these kinds of games taking time to learn the patten and get the timing perfect for each jump. 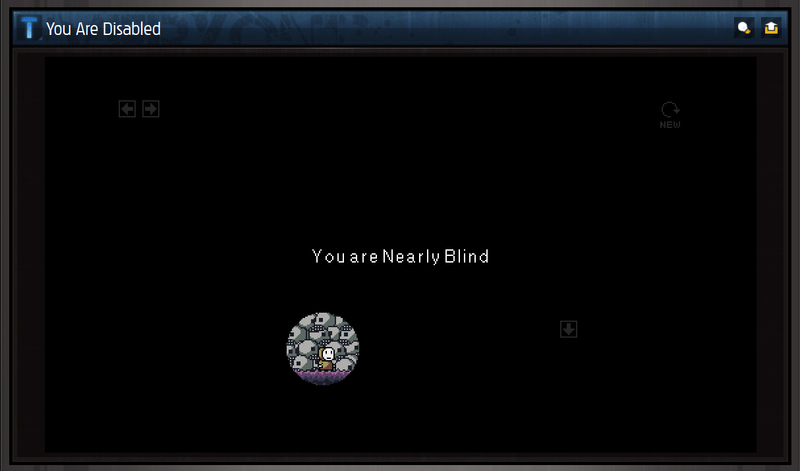 I refreshed the game and tried again this time I was illiterate, this did not effect the game play at all except for not being able to read the signs. Apart from the change in disability the game plays pretty much the same with difficulty varying depending on what handicap you are given. Just like Happy Wheels there is no real consequence for failing as you just start at the beginning of your current screen if you die this once again does not get me motivated to succeed and does not induce a state of flow. 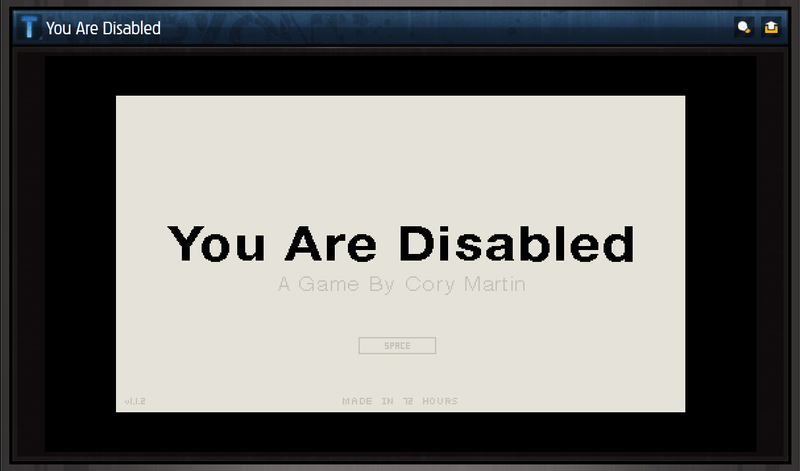 However the game is entertaining enough to pass five – ten minuets just to see what different disabilities you can encounter making it a good casual game.